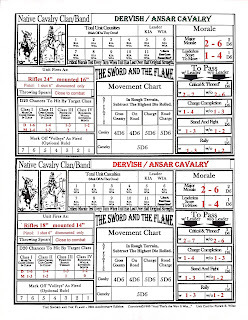 The Sword And The Flame is my favorite set of wargame rules for many reasons. They are fast, simple, and furious. 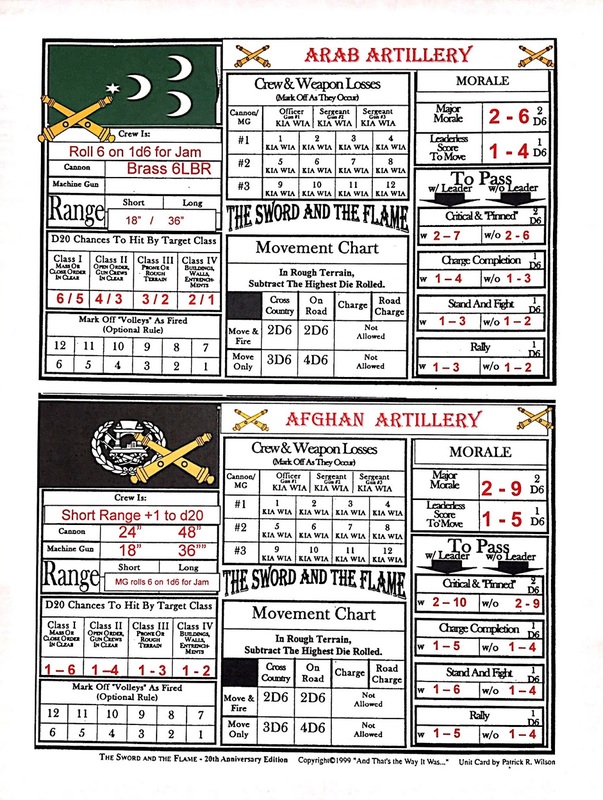 The rules cover a wide range of colonial conflicts and have many official and non-official variants for various theaters, conflicts, and campaigns. 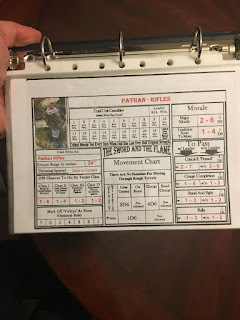 This post is about the Unit Data Card play aids for this rules set that were made by Patrick Wilson from The Virtual Armchair General decades ago. 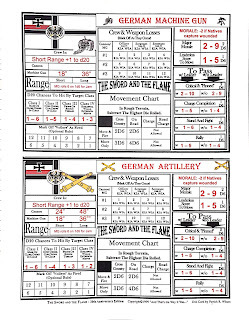 All the data a player would need to run their troops is on these cards, see the pic below of one of the original cards prior to customizing. The movement rates, firing, and morale are all included. The cards are filled out with the unit name and stats as desired depending on the nationality, unit, experience, and weapons used. 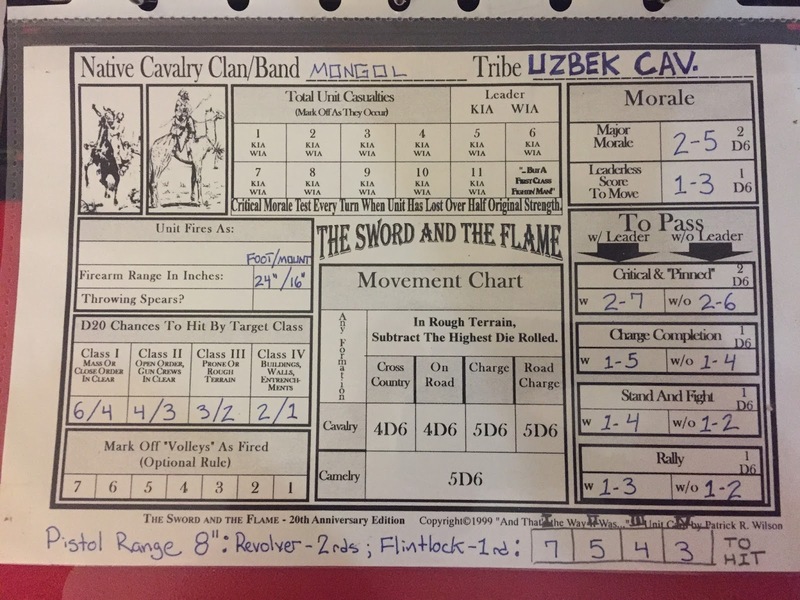 Below is an Uzbek cavalry card I made up for a scenario well over 10 years ago. I keep all my cards in a protective plastic holder in a binder. These cards are half of a regular sized sheet of paper. The above cards were more than adequate for several decades. I have used old school cut and paste technology to personalize some of them, which literally meant I physically cut out a picture and glued it onto the data card. In this manner I customized and personalized the cards with pictures and font. 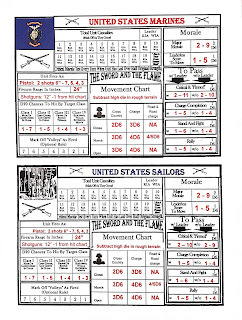 One day, about 2 plus years back my buddy Bill Hogan, another HMGS-South club member, sent me a power point slide with the old school TSATF data cards. He had digitized the cards and added fields that could be filled in with what ever data was desired. 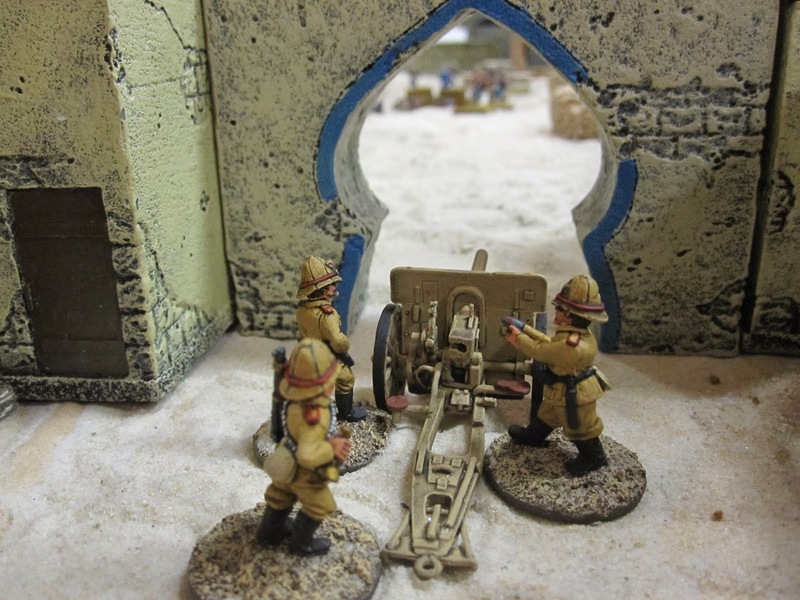 These were wonderfully done and opened up a whole new play aid dimension to the game. I played with the slide and discovered that by adding boxes, altering their size, and filling them in white I could change any value or item on the card. Being an artist in a past life I quickly altered, added, cleaned, and adjusted the cards as I desired for each individual unit. 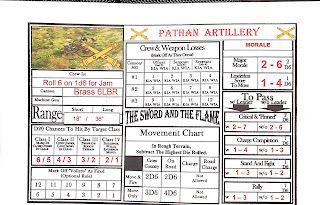 I added pictures of my own units or pics from the web, even national flags for the desired units. 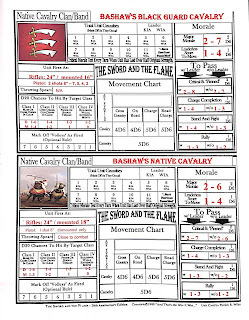 I added cool fonts in different colors to differentiate the units, tribes, and nationalities. 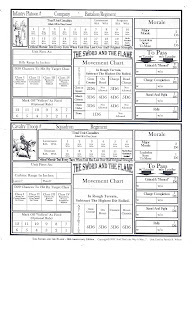 Below is an example of one of the game cards I made with Bill Hogan's awesome Power Point template. With Bill's digitized unit data cards the only limit is your imagination! 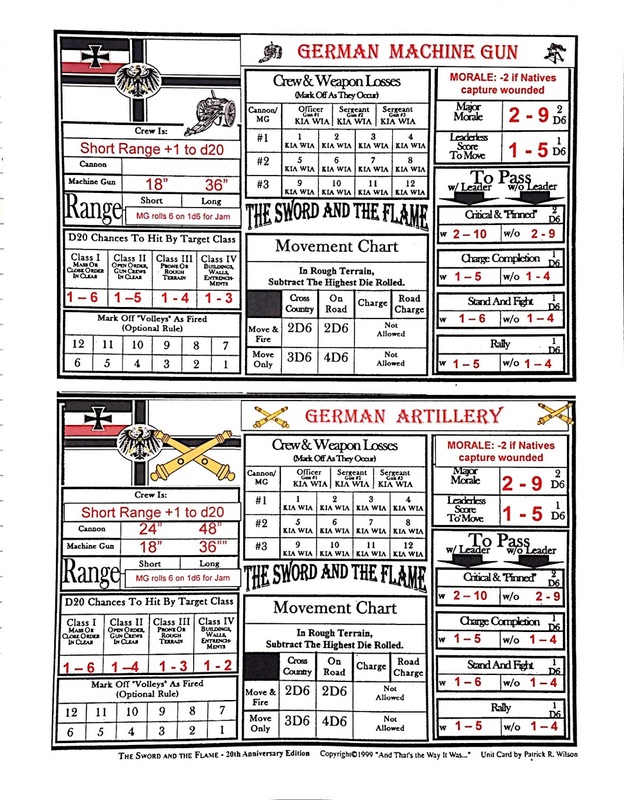 As you can see from the Unit Data card above Bill had added some cool graphics in different areas to help differentiate the units like crossed rifles for infantry, crossed sabers for cavalry, crossed cannon for arty, an anchor for naval troops, etc. These really make the cards stand out. 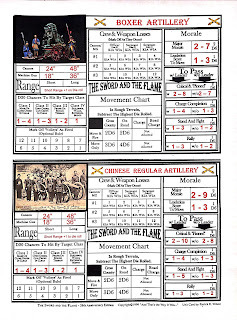 Being a workable doc I like to make custom cards for specialized scenarios like I did for my The Wind And The Lion games, my NWF, Sudan, and Boxer games, but most recently for my The Hun The Frog And The Lion Game. 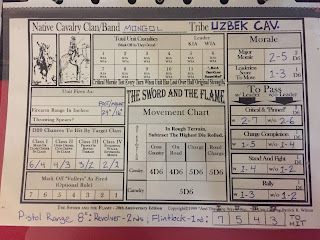 I alter the morale and hit tables as I see fit for certain battles, units, guns, and equipment. 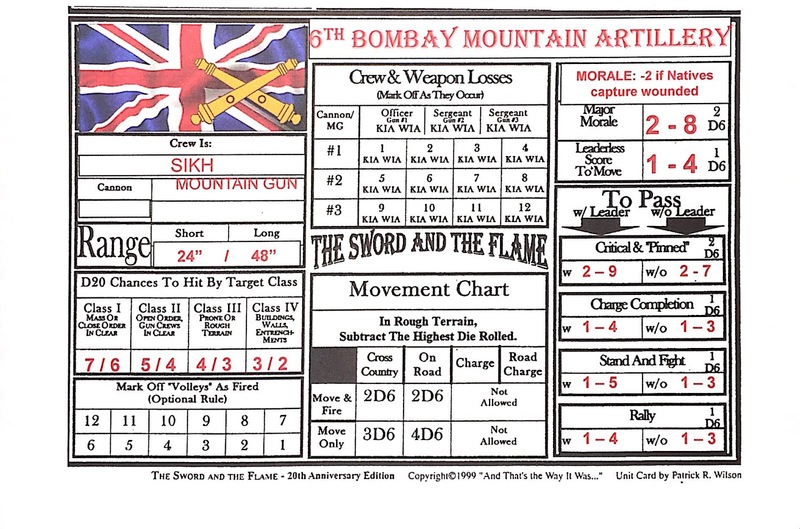 As previously stated the size of these cards is a half of a standard 8.5" x 11" sheet of paper. This lends itself well to be saved in a plastic sheet holder for a half size binder. All the cards can then be saved in theater or period binders. 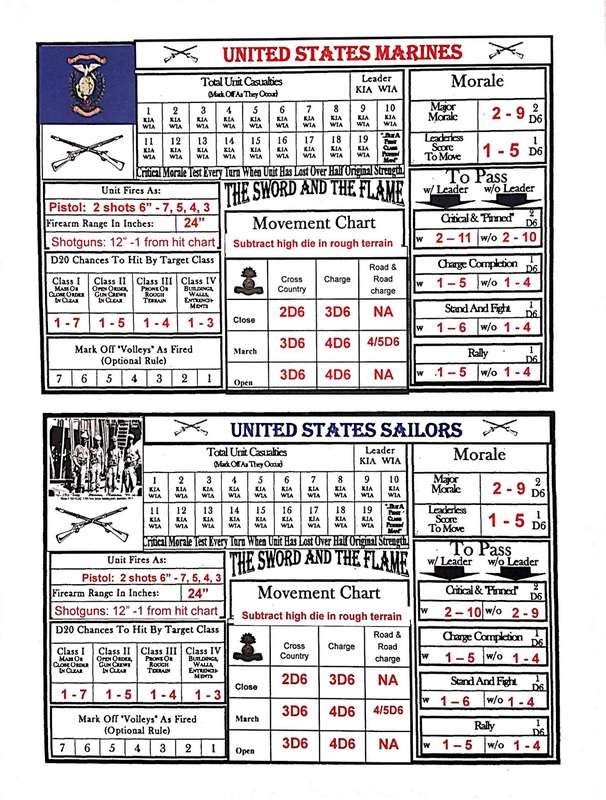 These plastic covered data cards are then distributed to the players prior to a game. 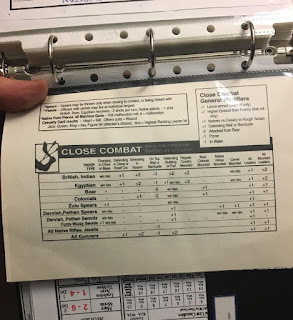 In addition I insert the melee table with the melee mods into the back side of these cards and now the players have all of the data that they need to run their troops without assistance from the GM. They also double as a cool coaster to keep the game table dry. Here are some tools of the trade as far as running and playing TSATF. 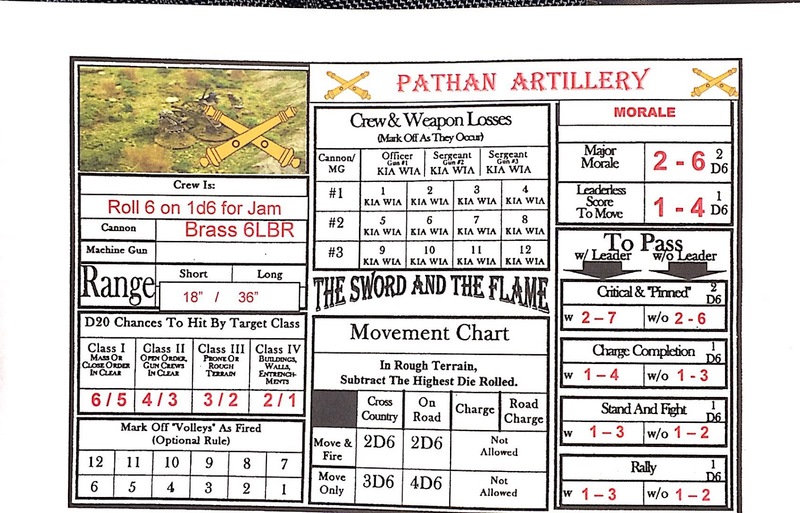 The aforementioned Unit Data Card Binder can be seen in the upper right hand corner. 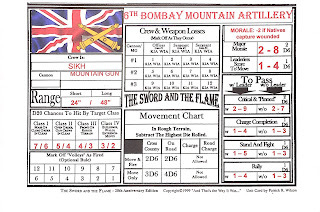 New Style Card made with Bill Hogan's template. 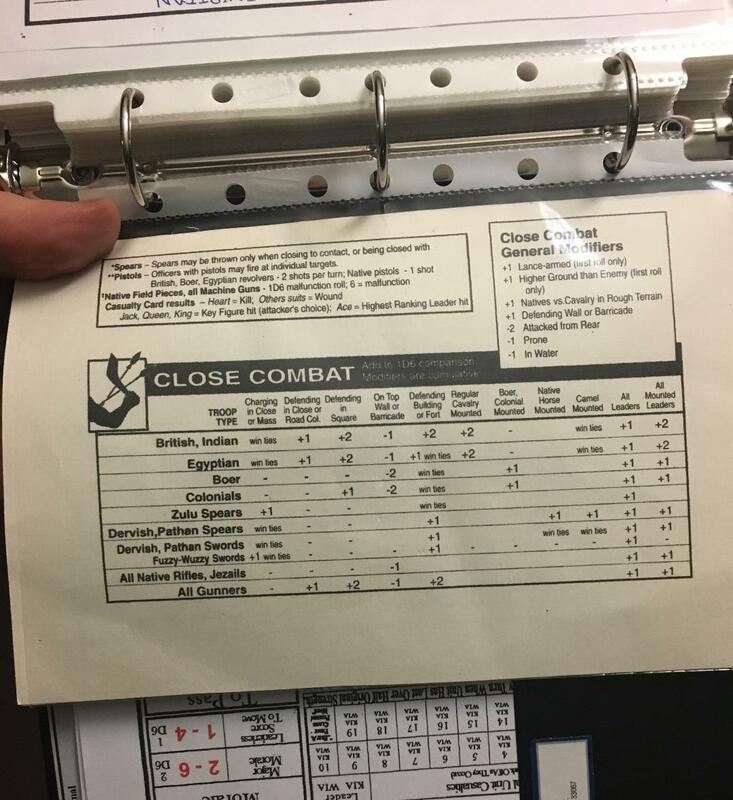 Above is a pic of the back of a Unit Data Card in the plastic holder in the binder. 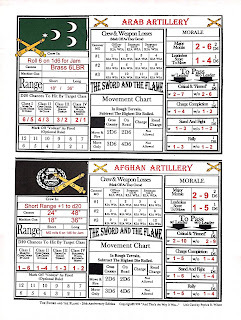 I added the much needed Melee table with melee modifiers to the back of the Unit Data Cards. You can't have a classic TSATF Melee without the melee table and melee mods!!! 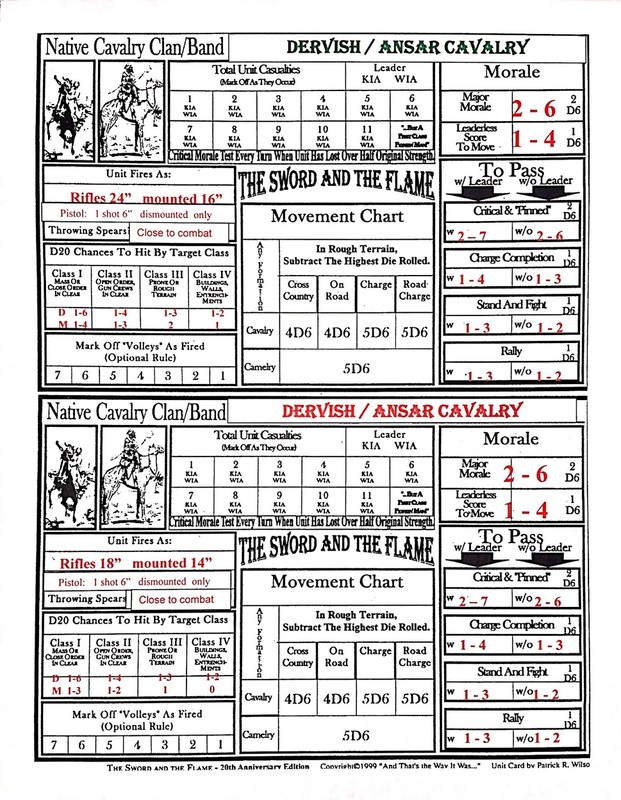 To me, the melee, the random movement of units by cards, and the random movement distance by dice is what really sets TSATF apart from other rules and what makes it so grand! 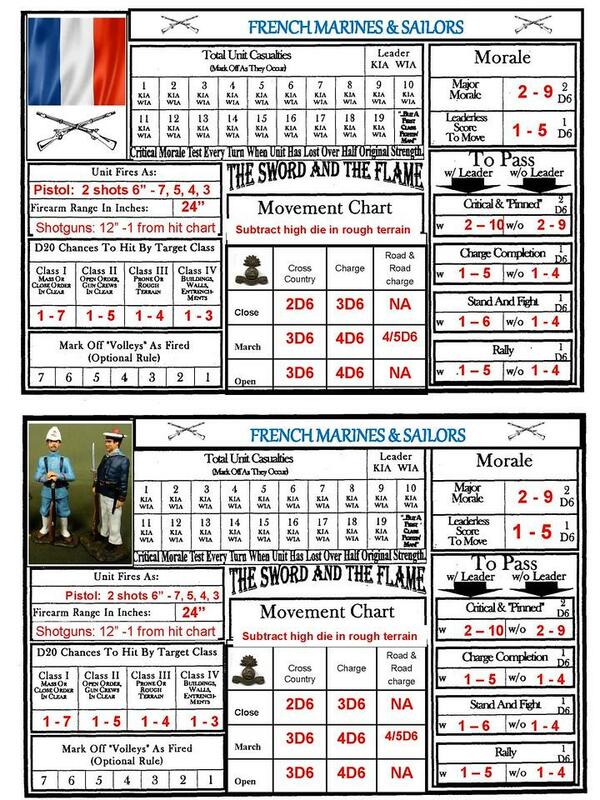 With these cards in hand any TSATF player be they a grizzled vet or a newbie (FNG) has all the data they need to run their troops for a game. 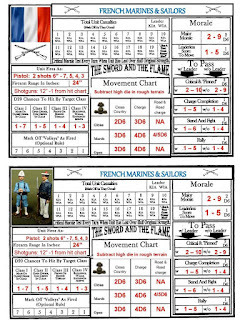 Game card for French Troops from The Hun The Frog And The Lion game I ran. 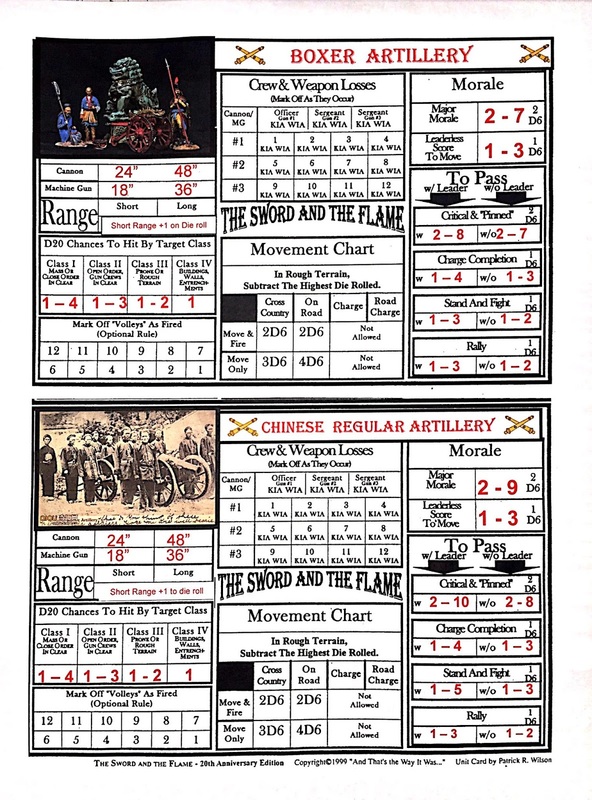 I had recently sent my newest edition TSATF unit data cards to a Mr. David Raybin when I saw him post on TMP (The Miniatures Page) that he was going to run his version of The Wind And The Lion scenario using TSATF. 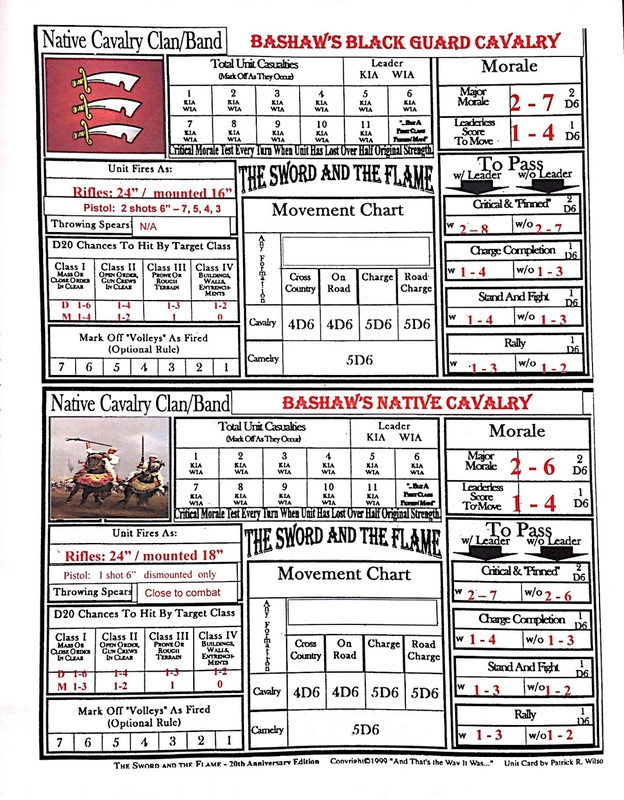 Since this is one of my most favorite movies, one of my favorite games to run, and my most favorite set of rules, I figured I'd offer him my customized unit cards. Most gamers I know are very generous with ideas and data so I paid it forward as I've been assisted so many times in my 45 years of gaming. 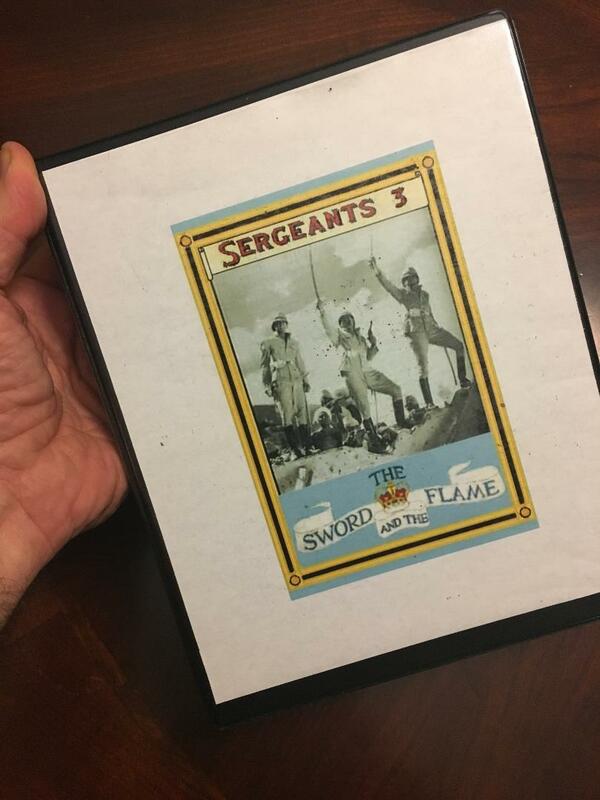 I'm always willing to help a gamer and especially to promote The Sword And The Flame. At the end of this post are links to The Sword And The Flame rules, HMGS-South and Colonial Barracks conventions where we run our TSATF games, and to TVAG who made the original cards and who sells all sorts of cool gaming and colonial wargame stuff. You can still get copies of the original unit data cards from TVAG. Below are a few samples of some of the cards I've made utilizing and customizing Bill's outstanding Unit Data Card templates. See you at the con! This one is for a scenario I got from Patrick Wilson and Richard Houston entitled, The Hun The Frog And The Lion. This is another game / scenario loosely based on the movie TW&TL.